Compact, fast FX-format 35mm prime lens that excels on Nikon's high-resolution HD-SLRs. Unleash the power of your high-resolution Nikon HD-SLR. The AF-S NIKKOR 35mm f/1.8G ED draws maximum definition and image quality from Nikon's high-pixel-count image sensors for truly dazzling photos and HD videos. It brings the outstanding optical characteristics of AF-S NIKKOR 35mm f/1.4G to Nikon's f/1.8 FX-format prime lens collection, which includes 28mm, 50mm and 85mm versions. With 63° of coverage, ED and AS glass elements for outstanding contrast and minimal distortion, Nikon's innovative Silent Wave Motor for fast, quiet, precise autofocusing and a lightweight, compact design, the AF-S NIKKOR 35mm f/1.8G ED is an outstanding choice for your photo or HD video applications. On an FX-format Nikon camera, a 35mm lens approximates the angle of view we see with our eyes, an ideal perspective for so many photo and HD video applications. The AF-S NIKKOR 35mm f/1.8G ED combines that natural perspective (52.5mm equivalent on DX-format cameras) with an f/1.8 maximum aperture for outstanding depth of field control and low-light performance—all in a compact, lightweight design. Capture vibrant natural looking photos and HD videos with softly blurred backgrounds, even in low light. A great lens draws peak performance from a camera, and the AF-S NIKKOR 35mm f/1.8G ED is no exception. Impressive on Nikon's FX- and DX-format D-SLRs, it delivers consistent, superlative performance, even in tough shooting situations. Aspherical (AS) and Extra-low Dispersion (ED) glass elements combat sagittal flare at wide aperture settings. Super Integrated coatings (SIC) enhance contrast and color and nearly eliminate ghosting, even in backlit scenes. And Nikon's innovative Silent Wave Motor (SWM) uses ultrasonic waves for fast, accurate, quiet autofocusing. 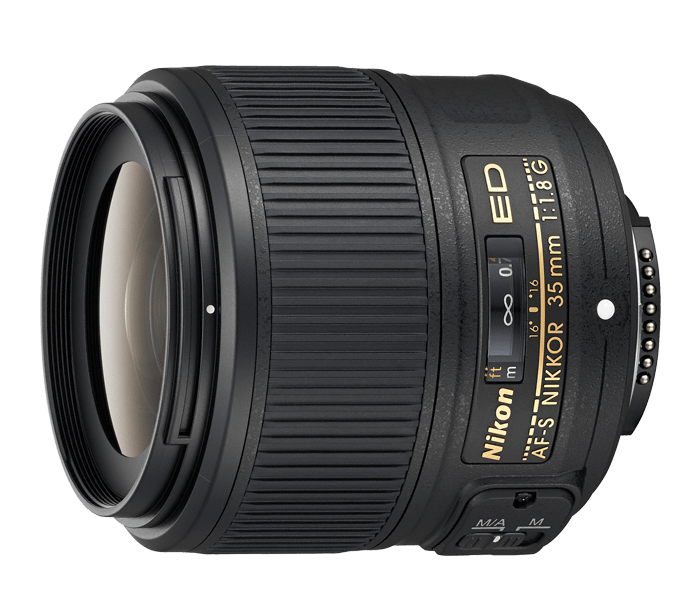 The AF-S NIKKOR 35mm f/1.8G ED completes Nikon's versatile collection of advanced f/1.8 FX-format prime lenses, joining the 28mm, 50mm and 85mm versions. All four lenses offer the latest Nikon advancements and optical design characteristics, providing consistent performance at each focal length: wide-angle, standard and medium telephoto. AS stands for Aspherical lens elements. This type of lens utilizes non-spherical surfaces on either one or both sides of the glass in order to eliminate certain types of lens aberration. A system in which only the rear lens group moves during focusing, thus eliminating changes in the physical length of the lens during focusing and enabling faster focusing. Such lenses are designated with RF on the lens barrel. Nikon Super Integrated Coating is Nikon's term for its multilayer coating of the optical elements in NIKKOR lenses.